This article helps you install and configure Ruby on Rails on CentOS 7. By following some simple steps you can start riding on rails. Please feel free to let us know if you got struck anywhere, we will help you fix it. Here, We assume that you are having a CentOS 7 installed server with root access. Before continuing the installation we need to install LAMP/LEMP. You can follow the link to install LAMP and then proceed with the installation. First of all, let me provide you a very short description about Ruby on Rails. Ruby is a programming language and while rails is just a Web application frame work which works on the principle (Model-View-Controller) MVC. Ruby on Rails is nothing but simply a web application framework written in Ruby. You can check there official link rubyonrails.org to know more. Rbenv is a ruby version management tool. We will use this to install and manage our Ruby installation. So let’s start the installation of rbenv. 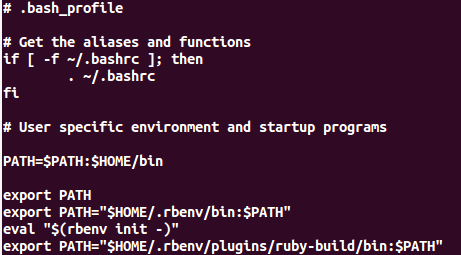 Installing the dependencies of Rbenv and Ruby. Use the following commands to install the dependencies. Now we are going to edit the bash profile file of the user who is going to use ruby. So make sure to take a backup of the .bash_profile at first . Then you may execute the following commands as the same user. Your bash profile look like the screen shot given below. Thus you have installed rbenv. After completing this step, please open a new terminal to start using rbenv otherwise it will show “rbenv not found error”. Now we are ready to install Ruby. Before starting the installation, Check which version of ruby you want to install. Here, We are installing Ruby 2.2.1. You may execute the commands below to install Ruby. The next step is to sets the default version of Ruby that all of your shells will use. If you want to install and use a different version, simply run the rbenv commands with a different version number. You can verify the installation using the command below. It will show you the version and details of the installation. Most of us do not want the documentation of each gems we install. If you would like to disable this, you may execute the command as below. Now, Install the bundler gem which is used to manage your application dependencies using the following commands. Thus the Ruby is installed. Now we can move on to the installation of Rails. As the same user who installed Ruby, execute the command below to install Rails. Here, We are installing Rails 4.2.0 version. We need to run rbenv rehash command whenever we use gem. to install/uninstall. The rbenv normally runs rbenv rehash automatically when you install/uninstall using gem. But to make sure, you may execute following command every time you use gem command. To check the version of Rails, you can execute the command below. Thus, We have completed the installation of Ruby on Rails. Normally, The Ruby on Rails application run on port 3000. So, we need to specify the port all the time we access any of the ruby application. To avoid this, We made here a very simple proxy setup in apache configuration. The configuration is as follows. In the above configuration, you need to specify your IP address instead “yourip” and save the file. After that, you may just restart the apache to reflect the changes. Thus the proxy setup via apache configuration is completed. Now we can test its working by creating an application. To make sure that the Ruby on Rails installation completed successfully, We can create a test application by following the steps below. Thus the configuration has been completed. Now, you can start your application by following the commands. Look at the screenshot below. If it is running properly, You will get a welcome aboard page by visiting the URL below. You will see a welcome aboard page. It is the smoke test for a new Rails application. it makes sure that you have your software configured correctly enough to serve a page. Thus you are ready to start developing your new Ruby on Rails application. Enjoy !! Saravanan S is a person who take everything positive and like to take chances. He always like to be in a challenging environment. Currently he is working as a System Engineer in Syslint Technologies.